Did you survive Halloween? Our house is definitely suffering! I think it’s going to take a little while to clean up the chaos. Do you go straight from Halloween to Christmas, or do you keep your home decorated for Fall until Thanksgiving? I keep my home dressed in Fall decor, so I’m shifting the spooky to a more simple Fall style. 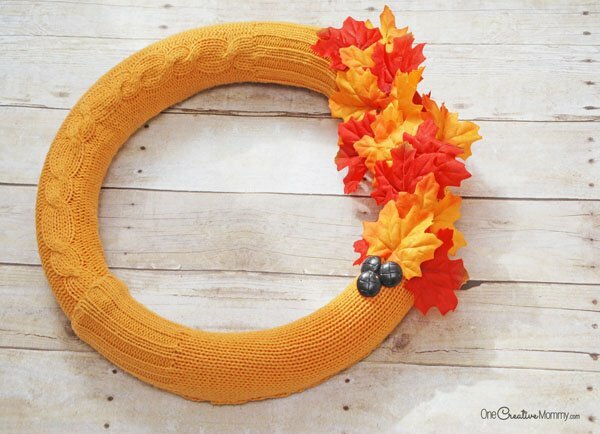 I’m starting with this cozy Fall wreath. Can you guess what I used to create it? Want to try your hand at making something like this? It wasn’t very hard. Stitching the sweater over the noodle took a little bit of time, but it was strangely soothing. It was pretty relaxing to stitch while I listened to a book on my phone. Once you have your noodles and a sweater, you need your wreath shape. It’s super easy to turn a pool noodle into a wreath. Using the serrated knife, cut off one end of the noodle at an angle. Now it’s time to create your wreath. 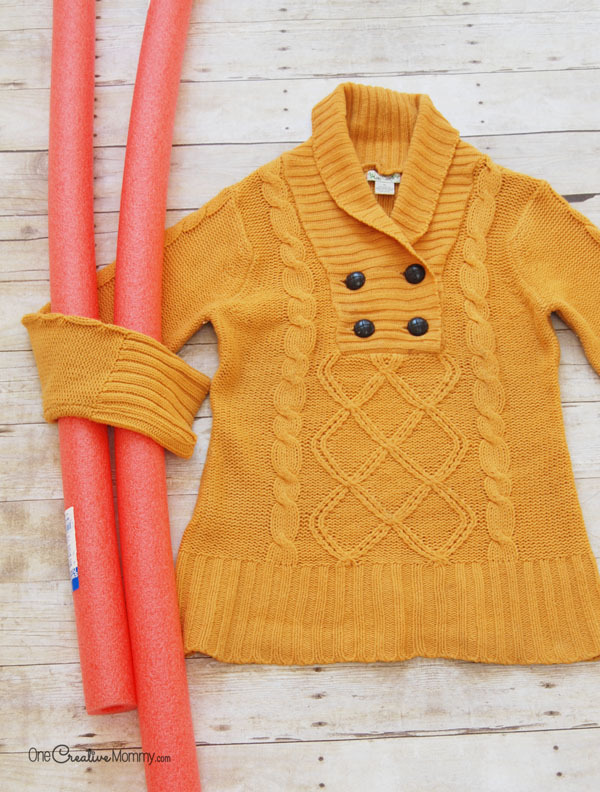 Cut the sweater apart at the seams, and wrap pieces around the pool noodle wreath until you find a combination of pieces and textures that you like. I ended up using one sleeve and one piece from the back of the sweater. Cut the pieces so that there is about 1/4 inch of overlap as you wrap the sweater around the noodle. Put the ugly edges at the back of your wreath and stitch the sweater tightly together around the noodle. (Your seam should be on the back side of the wreath. When your pieces overlap, put clean edges (like the bottom of the sweater or the ends of the sleeves) on the top, and tuck the cut edges underneath. Stitch those pieces together, too, so that they don’t slide around. 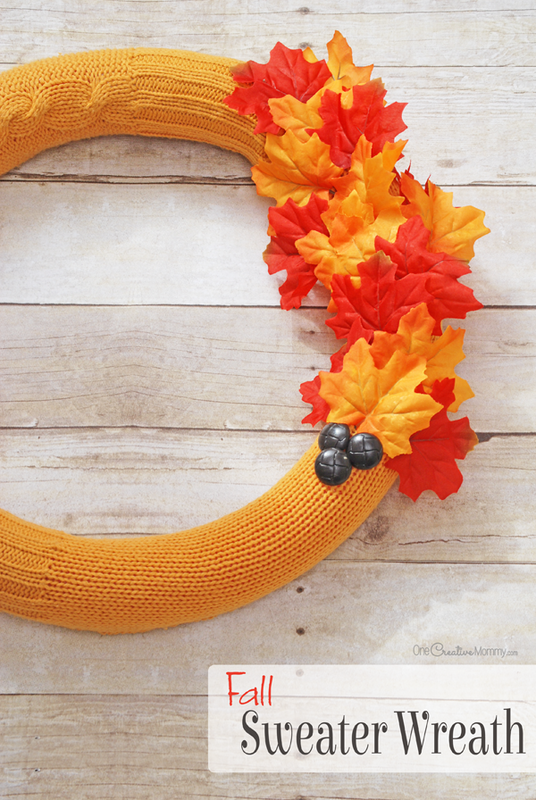 Once you have your sweater pieces completely sewn onto the wreath, embellish the wreath with Fall accents. I used fabric leaves and the buttons from the sweater, but you could use anything. Pine cones, real Fall leaves, acorns, buttons, and any other small Fall knickknacks you have lying around. What would you put on your sweater wreath? Thanks for stopping by today. I hope you have a fantastic week. 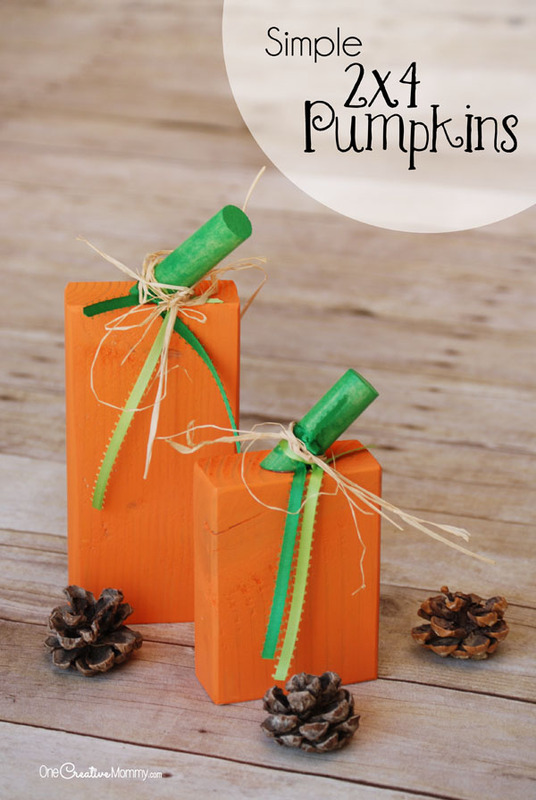 While you’re here, be sure to check out more great ideas for Fall and Thanksgiving. The images below are linked to posts, so click on them to pay a visit and get the tutorials. Super cute! The pool noodle idea is brilliant! I love how adorable it is and how affordable the materials are. I’ll have to make one next week! Thanks, Shannon. 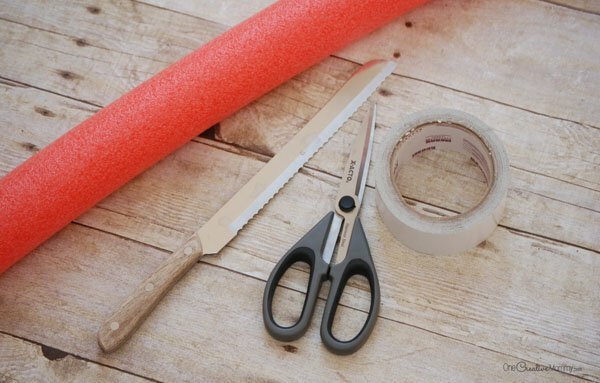 Pool noodles are so great for crafts. 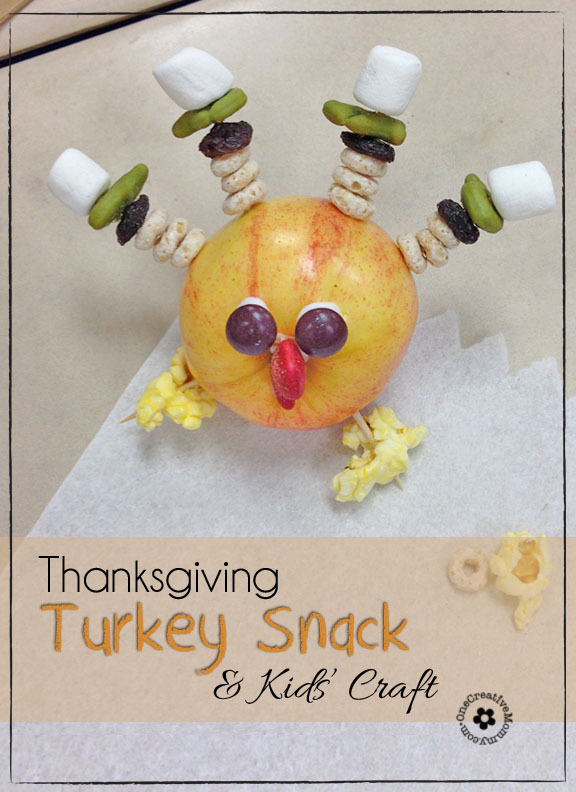 This is a super creative idea and what a cute result! I would had never though of the pool noodle and jumper to be honest! Thanks, Corinne. I’m not sure where the idea came from. I have the weirdest ideas sometimes! This is SO creative. I would never think to do something like this. I might have to try it out with my daughter. Thanks, Amber. 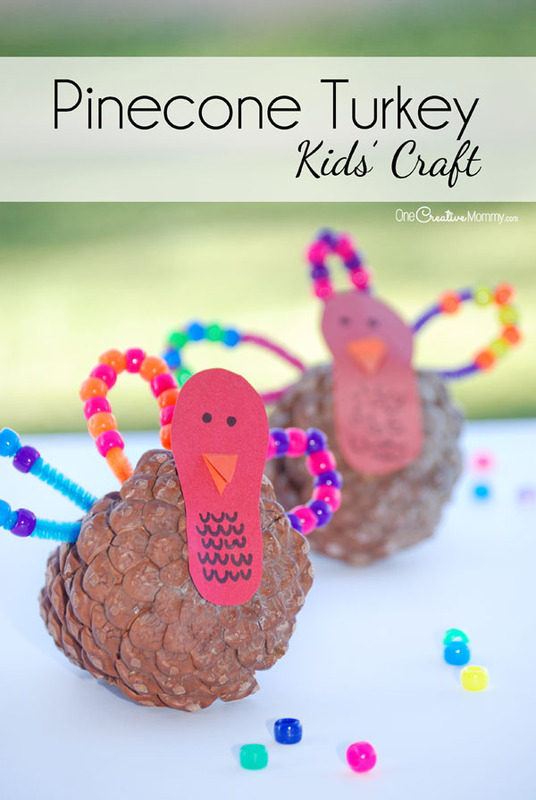 Have fun creating decorations with your daughter! I love your creativity. Something about chunky knit sweaters makes me so happy. I love this wreath! Thanks, Jen. I love chunky knit sweaters, too. They make me think warm and cozy thoughts. There seems to be so much you can do with pool noodles! I am loving the idea of this wreath it is so colourful. Thanks, Sarah. The wreath was a lot of fun to make. Thanks for taking the time to comment. This wreath is so cute. I will have to get the supplies I need to make one this weekend. It is going to look great on my front door. Thanks, Claudia. I hope the wreath turns out well for you! Happy holidays. What a creative idea to use a pool noodle as a wreath! The sweater cover is interesting as well and makes it so unique! Thanks, Jen. I’ve seen pool noodle wreaths all over the web, and I decided it was time to try one myself! This is such a good DIY project for Christmas! I should try it soon. Thanks for stopping by to leave a comment, Emman. Have a great week. Wow you are so creative! The colors look amazing! Thanks, Yvon. I hope you have a great week. Thanks for stopping by. Thanks, Kitty. Have a great week. Thanks for stopping by the blog. This looks like such a fun little project! I have tons of leftover pool noodles crowding up my shed right now! Thanks, Jessica. Pool noodles make great wreaths. You should give it a try. These are so cute! Wow, maybe I will try going DIY this year! Thanks, Sondra. You should definitely try it. Thanks for stopping by and leaving a comment. This is probably one of the cutest wreaths I have ever seen! How clever to use the sweater! Thanks, Kelly. That’s so sweet of you to say! Thanks for stopping by. Oh my gosh, that is such a good idea! I have an old sweater that’s kind of mauve with a hole in it. But it’d be a great fall wreath! Give it a try, Heather. I’d love to see how it turns out. As a fellow craft blogger all I can say is Wow! This is genius and very well made! Thanks, Akamatra. Have a great week! Thanks for stopping by. Never think of this!! Would surely try this for our home. Very creative!! Thanks, Chuck. Have a great week. So creative! 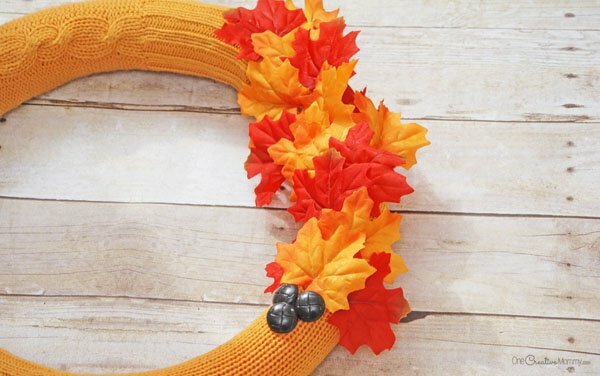 Perfect wreath for fall! 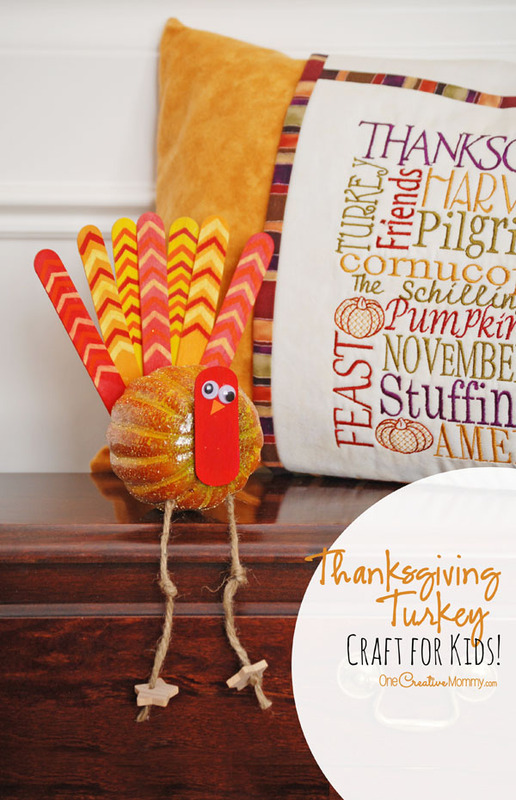 This is such a fun upcycle craft. It turned out so cute. Thanks, Chelsea. It was a fun project. Have a great week. What great ideas on transforming older items into something new. I surely never would have thought of the sweater wreath! Thanks, Megan. It was a fun project. Have a great week. I love the fall wreath that you’ve made. My favorite is the one you made. Absolutely adorable!